A woman sewing a dress for her anniversary night out finds herself presiding over her young daughters as they cut apart their own clothes. A four year old boy going earnestly about the business of being a four year old boy is perplexed as to why his behavior seems to have dramatic effects on his mother. An elementary school volunteer learns about a role-playing card game from a young boy, and then sees the roles play out in her own home. College friends and couples reunite for a drink, and find that although their campus couplings are in the past, their sexual competitions are still very much present. Short story collections are hard for me to write about and, as a result, I tend not to review them. There is a temptation to write about every story individually, and I just don't think that's effective. I feel that, with a collection, you really need to look at it as a whole. While the stories may stand on their own, I can have a vastly different experience reading a story from a collection instead of in a periodical or somehow "on its own." I feel that this particular book really needs to discussed in its whole. Like any successful short story collection, there is a thread that holds all the stories together. In this case, it is the experiences of women. I appreciated how this collection was assembled. The common theme is clear, but all of the stories tackle it from a different viewpoint. While each story has a similar theme, they all have a different path to that theme. Along with that, Rechner's voice changes for each story. This is critical--nothing is worse that reading a short story collection where all the stories sound exactly the same. I appreciated being able to read this collection as both a whole and as individual stories. Best of all, I related to these stories. Yes, I related to some more than others and sometimes the connection I felt was anchored to a mere detail of the story, but the connection was always there. I realize that this is personal--the next person reading this book may not have the same experience. Still, I rarely find myself as personally invested in a short story collection as I did with this one. I would encourage anyone who enjoys short stories to check out this collection. Even if someone else doesn't experience the connection I did, I doubt that they will be disappointed with it. 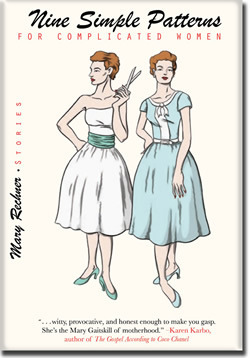 Mary Rechnar is definitely an author I will reading more of in the future.